I like to contemplate terms that are used by art historians. One of them is “still life.” In French it’s “nature morte” (dead nature) and in German it’s “Stillleben” (still/quiet life). In previous posts I’ve told you how the genre of still life emerged during the Renaissance in Northern Europe, and then blossomed as a full-fledged subject matter during the Baroque period (ca. 1600–1750). The interesting thing about still life is that it emerged at the same time that there was a burgeoning middle class in Europe eager to patronize art the same as the nobility. Previously, religious and history subjects, as well as portraits, were the sole domain of painting. With the emergence of a prosperous middle class in the Netherlands, still life and landscape became wildly popular subjects in their own right. 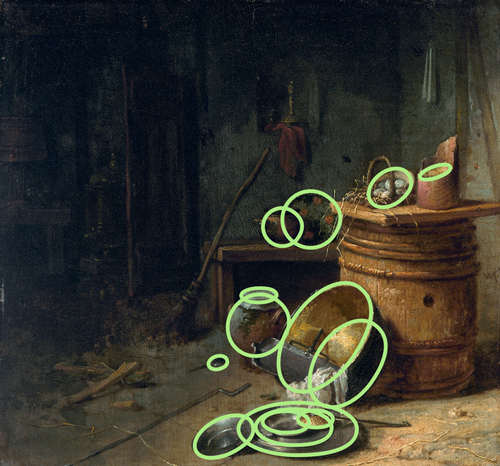 My question to you is: Is this painting a still life? I tend to think it is because of the careful arrangement of various objects that specify what the space is. Let’s think of it as an interior displaying a large still life, because the still life is obviously the emphasis. 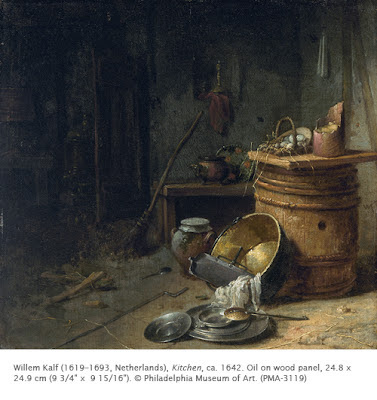 Willem Kalf was born in Rotterdam, the son of a well-to-do textile merchant. Little is known of his training or why he decided to become an artist. It may be because he was related to a famous painter Willem Buytewech, or the possibility of contact with artists who bought canvas from the family business. He moved to Paris in about 1640 where he was active in a small community of Dutch artists working there. He appears to have had considerable influence on the other artists there, although little is known of his roughly three years in Paris. He was, however, through with his artistic training by that time. He returned to Rotterdam in 1646, and in 1651 moved to Amsterdam where he spent the rest of his life. Interiors of barns and kitchens date from Kalf’s Paris years. He is more famous for his sumptuous (“pronk”) still life paintings he began producing in the 1650s. This seemingly humble interior is enlivened by the numerous objects scattered around. Although at first glance a casual arrangement, Kalf has actually built up a series of repeating ovals that draw the viewer’s attention into the painting. 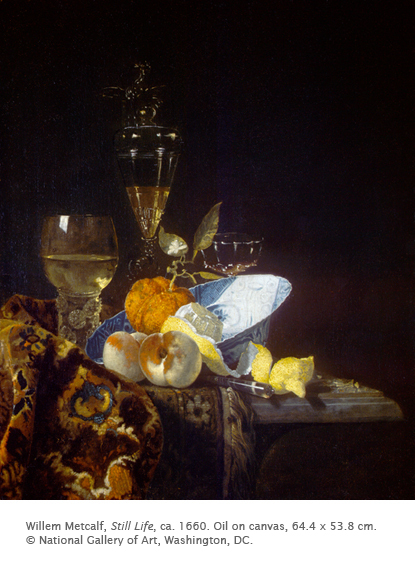 Even in this early work, Kalf was already experimented with surface textures and reflected light that became hallmarks of his sumptuous still life paintings. A subject like this was rare before the middle of the 16th century. Astonishingly little is known of Kalf’s years in Amsterdam, although his paintings are listed in inventories there. Apparently he attracted a group of collectors. That being said, the names of his apprentices are not known. Here is an example of one of his pronk still life works. Kalf gave up painting around 1680 to concentrate on work as an art dealer.